Kyokushin is a style / system of Stand-Up Full Contact Karate, founded in 1964 by Korean-Japanese Masutatsu Oyama. KYOKUSHIN in Japanese means "The Ultimate Truth". The Kanji (Japanese characters) calligraphy, worn universally on the front of the gi, simply means "Kyokushinkai", which is the name given by Sosai Mas Oyama to the karate style he created. It is composed of three characters. Shin meaning "Truth" or "Reality". Kai meaning "Society" or "Association". 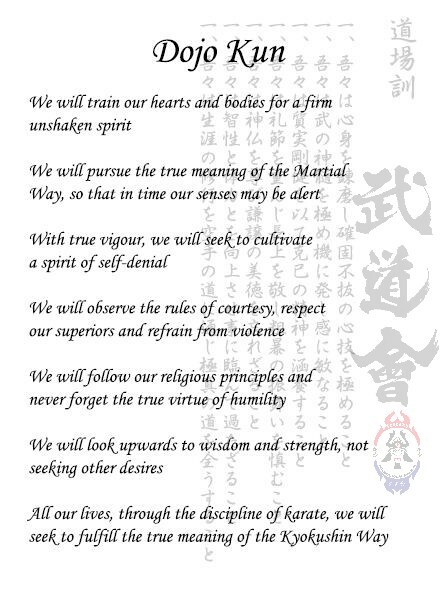 Kyokushin is rooted in a philosophy of self-improvement, discipline and hard training. Karate is a martial art and a way of life that trains a practitioner to be peaceful; but if conflict is unavoidable, true karate dictates taking down an opponent with a single blow. Such an action requires strength, speed, focus, control. But these physical aspects are only part of the practice; they are just the vehicle, not the journey itself. True karate is based on Bushido. In true karate, the body, mind and spirit—the whole person—must be developed simultaneously. Through kihon, kumite and kata we learn to control our movements. But more importantly, we learn to give up control too. We can perform the techniques without thinking about them, and remain focused without having to concentrate on any one thing. In essence, the body remembers how to move and the mind remembers how to be still..
1. The Martial Way begins and ends with courtesy. Therefore, be properly and genuinely courteous at all times. 2. Following the Martial Way is like scaling a cliff – continue upwards without rest. It demands absolute and unfaltering devotion to the task at hand. 3. Strive to seize the initiative in all things, all the time guarding against actions stemming from selfish animosity or thoughtlessness. 4. Even for the Martial Artist, the place of money cannot be ignored. Yet one should be careful never to become attached to it. 5. The Martial Way is centered in posture. Strive to maintain correct posture at all times. 6. The Martial Way begins with one thousand days and is mastered after ten thousand days of training. 7. In the Martial Arts, introspection begets wisdom. Always see contemplation on your actions as an opportunity to improve. 8. The nature and purpose of the Martial Way is universal. All selfish desires should be roasted in the tempering fires of hard training. 9. The Martial Arts begin with a point and end in a circle. Straight lines stem from this principle. 10.The true essence of the Martial Way can only be realized through experience. Knowing this, learn never to fear its demands. 11. Always remember, in the Martial Arts, the rewards of a confident and grateful heart are truly abundant. 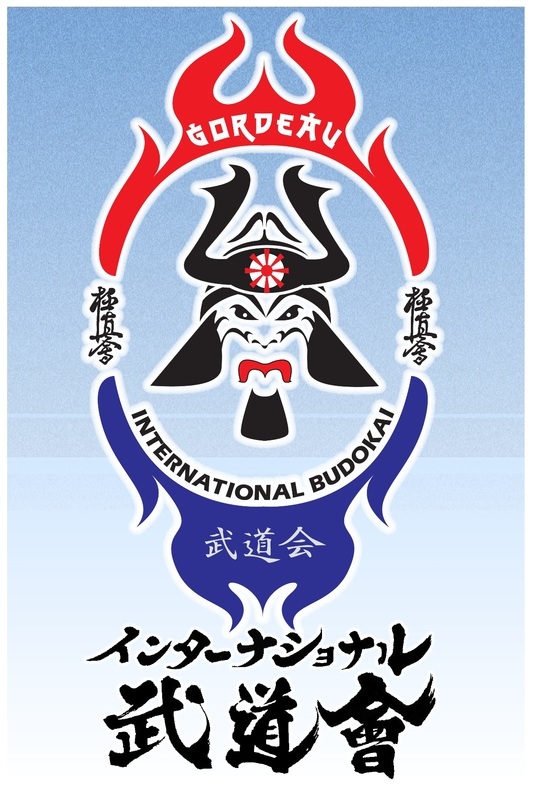 The symbol of Kyokushin Karate is the Kanku, which is derived from Kanku Kata, the sky gazing form. In this kata, the hands are raised and the fingers meet to form an opening through which the sky is viewed. The top and bottom points of the Kanku represent the first fingers of each hand touching at the bottom, symbolizing the peaks or ultimate points. The thick sections at the sides represent the wrists, symbolizing power. The center circle represents the opening between the hand through which the sky is viewed, symbolizing infinite depth. The whole Kanku is enclosed by a circle, symbolizing continuity and circular action. Osu means patience, respect and appreciation. In order to develop a strong body and strong spirit it is necessary to undergo rigorous training. This is very demanding, because you must push yourself to what you believe to be your limit, and you want to stop; top give up. When you reach this point you must fight yourself and your weakness and you must win. To do this you must learn persevere, but above all you must learn to be patient. This is Osu! The reason you subject yourself to hard training is because you care about yourself, and to care about yourself is to respect yourself. This self respect evolves and expands to become respect for your instructor and fellow students. When you enter the dojo you bow and say "Osu". This means you respect your dojo and the time you spend training there. This feeling of respect is Osu! During training you push yourself as hard as possible because you respect yourself. When you finish you bow to your instructor and fellow students and say "Osu"once more. You do this out of appreciation. This feeling of appreciation is Osu. 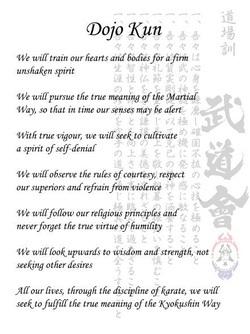 Thus Osu is a very important word in Kyokushinkai Karate because it signifies patience, respect and appreciation. That is why we Always use the word Osu; to remind ourselves of these indespensable qualities.